A hemiarthroplasty is an operation that is used most commonly to treat a fractured hip. The operation is similar to a total hip replacement, but it involves only half of the hip. (Hemi means half, and arthroplasty means joint replacement.) The hemiarthroplasty replaces only the ball portion of the hip joint, not the socket portion. In a total hip replacement, the socket is also replaced. All of the blood supply to the femoral head (the ball portion of the hip) comes through the neck of the femur (femoral neck), a thinner section of the thigh bone that connects the ball to the main shaft of the bone. If this blood supply is damaged, there is no backup. One of the problems with hip fractures is that damage can occur to these blood vessels when the hip breaks. This can lead to the bone of the femoral head actually dying. Once this occurs, the bone is no longer able to maintain itself. This can lead to one of the complications of a hip fracture called avascular necrosis (AVN). This condition occurs when the blood supply to areas of the femoral head are damaged. The dead bone may eventually collapse, causing pain in the hip. What do surgeons hope to achieve with the operation? Fractures of the hip often involve the femoral neck. In many cases, the risk of developing AVN is so high that your surgeon may suggest not trying to fix the fracture. Instead, the femoral head can be removed and replaced with an artificial piece, or prosthesis. This is suggested because fixing the fracture carries a high chance that you will need a second operation several months later if the femoral head dies due to AVN. When the hip is fractured, the socket portion (the acetabulum) is usually not injured. 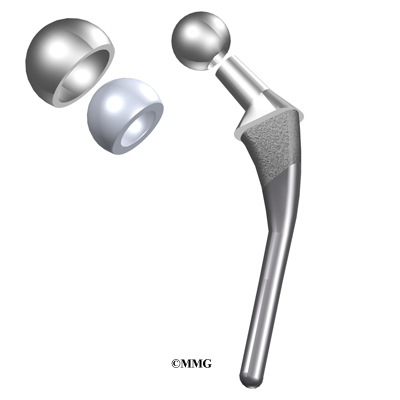 If the articular cartilage of the hip socket is in good condition, the metal ball of the hemiarthroplasty prosthesis can glide against the cartilage without damaging the surface. This procedure is easier to do than replacing both the ball and the socket, and it allows patients to begin moving right away after surgery. Early movement helps prevent dangerous complications that come from being immobilized in bed. A fracture of the hip in an aging adult is not simply a broken bone, it is a life-threatening illness. Replacing the damaged section of hip with a hemiarthroplasty can quickly get the patient out of bed and moving to reduce the risk of complications. This procedure is usually an emergency surgery, so it is likely you may not have had time to plan and prepare. Ideally, a caregiver, such as a family member or friend, will help make arrangements for you while you are in the hospital. The surgeon and care team will communicate with your caregiver to help with these preparations. Your caregiver will help coordinate your ride home, prepare your home for your arrival, make sure you have needed supplies, and schedule follow-up appointments with your surgeon, doctor, and physical therapist. Before we review the procedure, let's look at the prosthesis that is inserted into your hip during surgery. As described earlier, the hemiarthroplasty prosthesis replaces the femoral head. The prosthesis is composed of a metal stem that fits into the hollow marrow space of the thighbone (the femur). 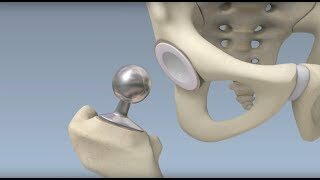 It also has a metal ball that fits into the socket of the hip joint (the acetabulum). The femoral head that attaches to the stem may be a separate part. Two types are commonly used by surgeons. Some surgeons prefer a solid metal ball to replace the femoral head. This type of prosthesis is called a unipolar type. Other surgeons prefer to use a bipolar type of prosthesis. The bipolar type has a femoral head that swivels where it attaches to the stem. The bipolar prosthesis was designed to try to reduce the wear and tear on the articular cartilage inside the acetabulum. It is unclear whether the swivel offers any significant advantages. Both types seem to work well. A cemented prosthesis is held in place by a type of epoxy cement that attaches the metal to the bone. An uncemented prosthesis bears a fine mesh of holes on the surface that allows bone to grow into the mesh and attach the prosthesis to the bone. Both methods are still widely used. The decision about whether to use a cemented or uncemented prosthesis is usually made by the surgeon based on your age, the condition of your bones, your lifestyle, and the surgeon's experience. To begin, the surgeon makes an incision on the side of the thigh to allow access to the hip joint. Several different approaches are used to make the incision. The choice is usually based on the surgeon's training and preferences. Once the hip joint is entered, the surgeon removes the femoral head from the acetabulum. Special rasps (coarse files) are used to shape the hollow femur to the exact shape of the metal stem of the prosthesis. Once the size and shape are satisfactory, the stem is inserted into the femoral canal. Again, in the uncemented variety of femoral component the stem is held in place by the tightness of the fit into the bone (similar to the friction that holds a nail driven into a hole slightly smaller than the diameter of the nail). In the cemented variety, the femoral canal is enlarged to a size slightly larger than the femoral stem, and the epoxy-type cement is used to bond the metal stem to the bone. 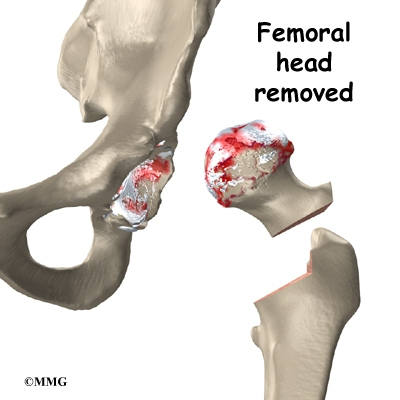 The metal ball that makes up the femoral head is then attached. 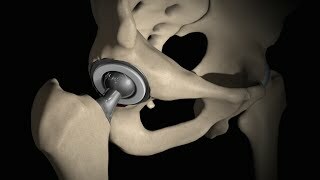 Once the implant is in place, the new artificial hip is relocated (or reduced) back into the hip socket. 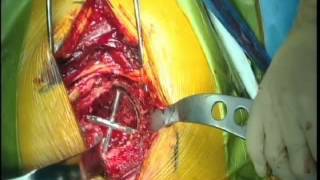 The surgeon makes sure that the hip works properly and the joint moves easily. The surgeon then closes the incision with several layers of stitches under the skin and uses stitches or metal staples to close the skin. A large bandage is placed on the incision, and you are then returned to the recovery room. Infection can be a very serious complication following any joint replacement surgery, such as hemiarthroplasty. The chance of getting an infection following hemiarthroplasty is probably around one percent. Some infections may show up very early, even before you leave the hospital. Others may not become apparent for months, or even years, after the operation. Infection can spread into the artificial joint from other infected areas. Your surgeon may want to make sure that you take antibiotics when you have dental work or surgical procedures on your bladder or colon to reduce the risk of spreading germs to the joint. The operation requires the surgeon to open up the hip joint. This puts the hip at risk of dislocating if the ball comes out of the socket. There is a greater risk just after surgery, before the tissues have healed around the joint, but there is always a risk. Your physical therapist will instruct you how to avoid activities and positions which may have a tendency to cause a hip dislocation. A hip that dislocates more than once may have to be revised (which means another operation) to make it more stable. Patients with diseases such as Parkinson's or Alzheimer's are at higher risk of dislocating their hip. The main reason that joint implants eventually fail continues to be loosening of the metal or cement from the bone. Great advances have been made in extending how long artificial replacement parts will last, but most will eventually loosen and require a revision. Hopefully, you can expect 12 to 15 years of service from replacement parts for the hip, but in some cases the hip will loosen earlier than that. A loose hip is a problem because it causes pain. Once the pain becomes unbearable, another operation will probably be required to revise the hip. 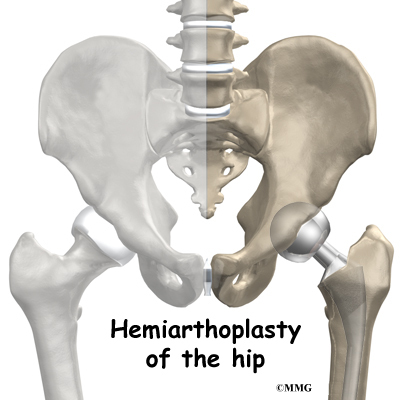 A hemiarthroplasty only replaces the ball portion of the hip joint. This means that the metal ball is constantly rubbing against the articular cartilage inside of your natural hip socket. The socket may become arthritic as the cartilage wears out over time. 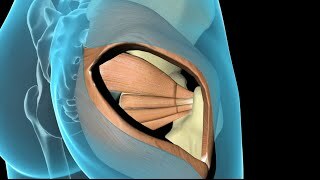 If this occurs, the hip will become painful just like any other arthritic joint. If the pain becomes unbearable, the hemiarthroplasty may need to be converted to a complete artificial joint. This means that the socket will be replaced with a new artificial socket. The metal stem may not need to be replaced. Physical therapy treatments are scheduled one to three times each day as long as you are in the hospital. Your first treatment is scheduled soon after you wake up from surgery. Your therapist will begin by helping you move from your hospital bed to a chair. By the second day, you'll begin walking longer distances using your crutches or walker. Most patients are safe to put comfortable weight down when standing or walking. If your surgeon used a noncemented prosthesis, you may be instructed to limit the weight you bear on your foot when you are up and walking. Your therapist will review your hip precautions. Your therapist will also go over exercises to begin toning and strengthening the thigh and hip muscles. Ankle and knee movements are used to help pump swelling out of the leg and to prevent the formation of blood clots. Patients are usually able to go home after spending four to seven days in the hospital. You'll be on your way home when you can demonstrate a safe ability to get in and out of bed, walk up to 75 feet with your crutches or walker, go up and down stairs safely, and consistently remember to use your hip precautions. Patients who still need extra care may be sent to a different hospital unit until they are safe and ready to go home. Most orthopedic surgeons recommend that you have routine checkups after this type of procedure. How often you need to be seen varies from every six months to every five years, according to your situation and what your surgeon recommends. Patients who have hemiarthroplasty surgery will sometimes have episodes of pain, but when you have a period that lasts longer than a couple of weeks you should consult your doctor. During the examination, the orthopedic surgeon will try to determine why you are feeling pain. X-rays may be taken of your hip to compare with the ones taken earlier to see whether the prosthesis shows any evidence of loosening. These recommendations may include that you use a raised commode seat and bathtub bench, and that you raise the surfaces of couches and chairs. This keeps your hip from bending too far when you sit down. Bath benches and handrails can improve safety in the bathroom. Other suggestions may include the use of strategic lighting and the removal of loose rugs or electrical cords from the floor. During this period, you should continue to use your walker or crutches as instructed. If you had a cemented prosthesis, you'll advance the weight you place through your sore leg as much as you feel comfortable. If the prosthesis was not cemented, your surgeon may want you to place only the toes of the operated leg down for up to six weeks after surgery. Most patients progress to using a cane in three to four weeks. Your staples will be removed two weeks after surgery. Patients are usually able to drive within three weeks and walk without a walking aid by six weeks. Upon the approval of the physician, patients are generally able to resume sexual activity one to two months after surgery. The need for physical therapy usually ends when home care is completed. A few additional visits in outpatient physical therapy may be needed for patients who still have problems walking or who need to get back to heavier types of work or activities. Your therapist may use heat, ice, or electrical stimulation if you are still having swelling or pain. Many patients have less pain and better mobility after having hip replacement surgery. Your therapist will work with you to help keep your hip joint healthy for as long as possible. This may require that you adjust your activity choices to keep from putting too much strain on your new prosthesis. Heavy sports that require running, jumping, quick stopping and starting, and cutting are discouraged. Patients may need to consider alternate jobs to avoid work activities that require heavy demands of lifting, crawling, and climbing. Join the Hip Discussion Group!